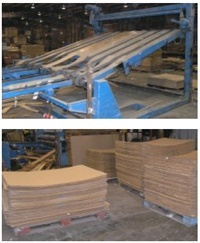 Used and New Pallets | Lumber & Things, Inc.
Products & Services of Lumber & Things, Inc.
We reclaim pallet components from the disassembly of unwanted pallets, recovering lumber to repair used pallets, or manufacture new pallets from recycled materials. Pallets assembled using all recovered pallet components and/or with some new lumber as requested by the customer. We have our own heat treating facility to treat and stamp pallets for worldwide export. In our commitment to total recycling, Lumber & Things, Inc. also provides a full-service paper recycling program, which includes corrugated, chipboard, and solid fiber craft collection and conversion. Solid fiber Kraft paper, chipboard and, corrugated slip sheets are recovered and converted into usable sizes. 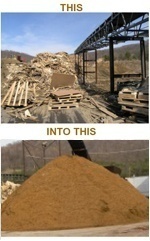 48,000,000 pounds of wood waste per year, converting it into an environmentally friendly, post-consumer product… MULCH. In comparison, this would be equivalent to covering over 20 square miles or 9,720 football fields with 6 inches of mulch.